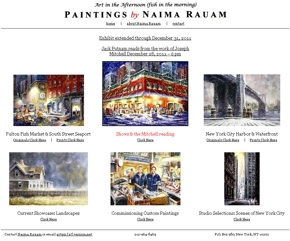 Fast Smart Web Design has worked with Naima Rauam on her site, Art in the Afternoon (fish in the morning), through two design iterations. Both the first and current versions are notable for what’s not there: No colored backgrounds, no busy banner, no complicated navigational strategies. Instead, because the site is so simple, your eye is drawn to the paintings themselves. Why is the site called “Art in the Morning (fish in the afternoon)”? Simple: When Naima started painting at the Fulton Fish Market, one of the fish mongers let her set up a gallery in his shop after the market closed at 11 a.m. The more descriptions you include, the better search results you get. This is obvious, of course, but it’s time-consuming to write descriptions–and if you’re spending your time describing old pieces, when do you get time to make new ones? But as Naima adds more text, her Google Analytics page shows more hits. Simplicity is not for everyone. When we showed Naima’s site to Russians in our usability workshop in Moscow, they didn’t like it at all. But after we toured the Hermitage in St. Petersburg a few days later, we guessed why the minimalist style was so unpopular in Russia. If your ideal staircase looks like this, why would you like a plain white background? This entry was posted on December 26, 2011 at 12:03 pm and is filed under search engine optimization, website design. You can follow any responses to this entry through the RSS 2.0 feed. You can leave a response, or trackback from your own site. That’s not art, that’s just the staircase leading to the art. When you get to the rooms holding the actual artwork, you are much further blown away. There is gold leaf on everything and the walls are three-dimensional with moldings, gee-gaws, and putti. Which is fine for the Hermitage, but on a website you don’t want to look at the walls the art is hanging on, you want to look at the art. The website should merely be the vehicle that brings the art (or information) and shouldn’t attract attention to itself.